​The foundation was laid on the 24th February 1886, St Matthias Day, by Lord Dufferin. It took nine years for the building to be completed. The Architect was F.R. Chisholm F.R.I.B.A. a government architect from Madras. The construction was initially undertaken by a private builder T. Drury who died at an early stage of the work. The construction was then continued by the Public Works Department under the supervision of H. Hoyne Fox, A.R.I.B.A. and assisted by Overseer U Hto Thoung, B.C.E. The responsibility of the government for the building ceased entirely on the day the Bishop signed the certificate of completion. As it was impossible to raise the full amount required by subscriptions alone in 1891, a special loan of Rs. 100,000 at 4% interest was obtained in 1894 on security of the site of the old church located between 25th/26th Streets. Funds became exhausted when the walls had risen to about one third of their full height and work was stopped for over a year. 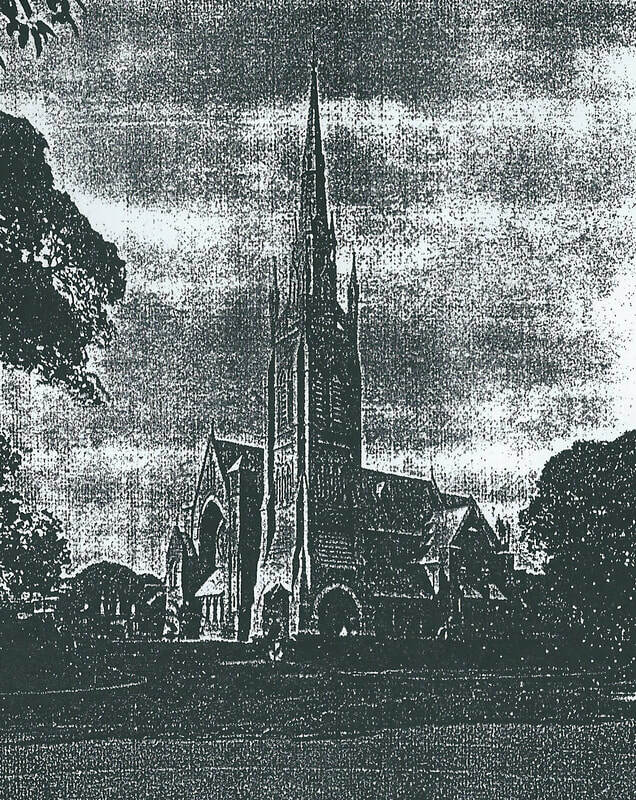 Together with Rs 11,000 from Diocesan funds, it sufficed to being the building into Service on the 18th November 1894 and this was a choral celebration of Holy Communion, the 26th Sunday after Trinity. Multiracial communicants knelt together at the sanctuary rails. The Bishop being on tour, Archdeacon Chard was Celebrant. Dr. J.E. Marks was Deacon and the Rev’d. John Shway Wine assisted as Sub-Deacon. ​When the Cathedral was opened there was no porch and no tower. The windows were plain glass, the floor mere cement and the walls simply plastered with no attempt at decoration. The furniture including the altar was transferred from the old Church. ​The first addition to the building was the Rose window, purchased with a legacy of £250 from John Goldenberg and installed in October 1896. This survived WW11. ​Mandalay on 27th August 1896. This altar was destroyed during WW11 when the Japanese used the Cathedral as a brewery. ​The five windows at the east end which also survived the war were presented by Gnanamutha Stephen, formerly a cashier of the Bank of Bengal. The panels reading from north to south represent the Ephipany, Baptism, Crucifixion, Resurrection and the Ascension. When Rs 35,000 had been collected at the end of 1904, the porch and tower to a height of 46 feet was built and the sanctuary was paved with grey and white marble. The Cathedral was consecrated on the 25th February 1905 by the Rt. Rev’d. Bishop Knight. Electric lights and fans were installed in 1906 the cost of which was donated by S.A. Mower. In 1908 the sanctuary was extended and the new portion was paved in black and white marble. The marble steps leading from the choir to the Presbytery were presented by A.W. Rodgers in 1913. The tower surmounted by the spire which rises to a height of 198 feet from the ground was completed in 1913. The necessary funds were provided from Bishop Strachan’s legacy to the Diocese and from the sale of the site of the Church house in 35th Street. On the 11th October 1914 the tower and bell were dedicated. The bell weighing 1,848 pounds was presented by Mrs Chard in memory of her husband Charles Henry Chard, who was Archdeacon in this Diocese. It was first rung on the 16th August 1914. 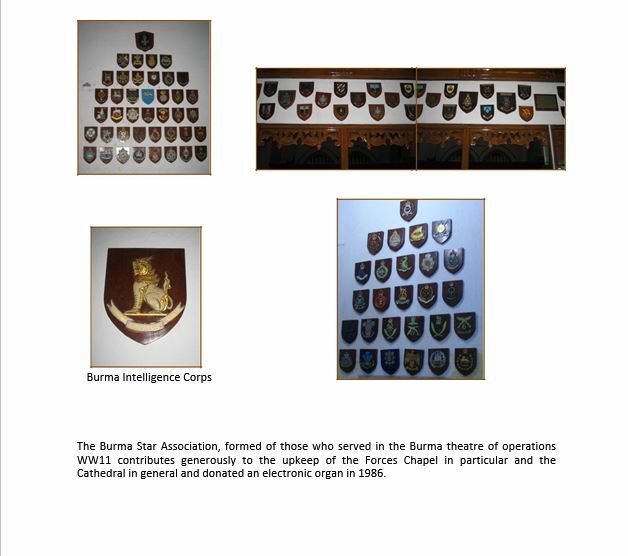 After the reoccupation the Cathedral was repaired by engineering units of the Twelfth Army (successor to the Fourteenth Army) which was formed in Rangoon on the 28th May 1945, thus the Chapel is now dedicated to the memory of various units of the 14th and 12th Armies. The regimental crests of most of the units are displayed on the walls of the north Chapel.